In October, Northwoods released a new feature in Compass® Tasks that automatically suggests the next available caseworker for a task from a preconfigured pool. Recipient pools replaces the need for a manual “tick list,” which many agencies use in their mailrooms and in other locations to assign a task within a group. No longer will workers need to remember to manually add a tick to the list, and multiple workers can assign tasks to the same pool simultaneously without overloading a single caseworker. Recipient pools allows a worker in a mailroom or other location to assign a task (for instance, route a form to a caseworker in a particular case bank) by accepting the next available worker suggested automatically by the system. When one worker is assigned a task, he or she moves to the end of the list and the system will suggest the next worker in line for the next task that comes up. Workers can assign tasks using the same pool from disparate locations in the agency. With recipient pools, agency workers can create and manage pools on a daily basis, if necessary. System Administrators can add, edit, and delete recipient pools and the associated member lists. 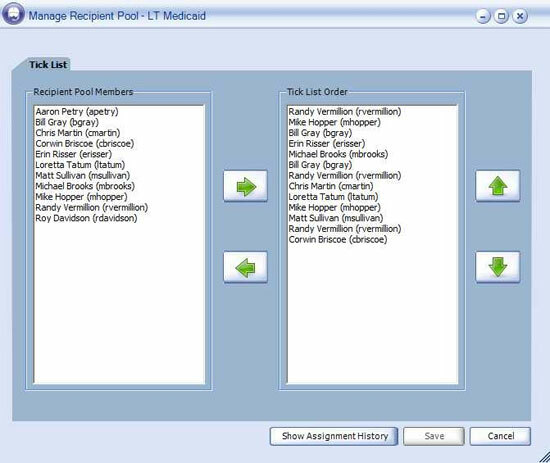 The pool manager can add, remove, and change the order of members in a pool. Daily updating of pool members can prevent their assignment of time sensitive tasks to workers who are sick or on vacation. 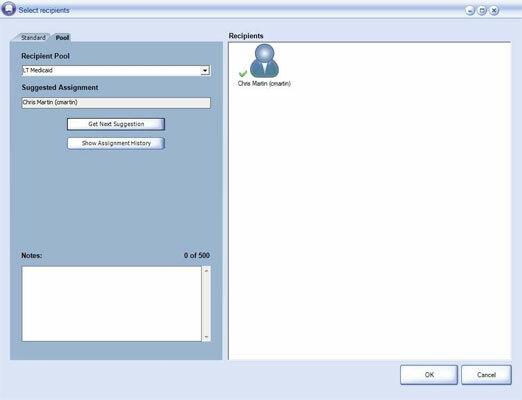 In Compass® Pilot, users can take advantage of recipient pools from the Select recipients user interface. There they will now see a Standard tab and a Pool tab. While the standard tab remains unchanged, the pool tab allows automatic recipient suggestion. The Get Next Suggestion button allows the worker to skip the current suggestion and move to the next recipient in the rotation, if necessary. In the recipient pool interface, a worker can also add a note to the task assignment and display a bar graph showing the assignment distribution of tick list members. To take advantage of recipient pools, agencies need to have version 4.9 and higher of Compass® software installed. In addition, they must use Compass as their tasking engine with a Laserfiche or OnBase DMS. Agencies that meet these requirements may setup recipient pools at no additional cost; however, the feature requires configuration changes that may necessitate professional services hours from Northwoods. Agencies interested in using Recipient Pools should contact their Northwoods client executive to discuss their options.